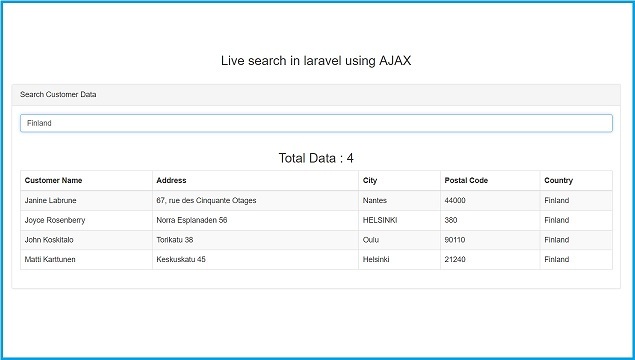 In this tutorial, We will learn the process of making a live search in Laravel and AJAX. If we have on a blog or any ecommerce website, a search texbox is always an required feature of Website User Interface. Now a days using of simple search bar is left. Because a live search of data is enough more useful than a plain search bar because it will load data of content in real time without refresh of web page. This will increment the chance of increase a sale because the customer can see the more section of related products. For demonstrate the functionality of live search, We will make customer table and search box for search live data through all column of customer table and display filter data on web page. First we have to make database connection in Laravel application and then after making of database connection we have to create controller in Laravel. For this we have to write following command in your terminal. Now go tp app/Http/controller/LiveSearch.phpand paste the following code in it. Now We have seen code and understand how code is working here. First we have create as index function which load view file we will create in the next step. After this we have we create one more function action that will received variable from search textbox through Ajax request and execute database query for search or filter data. This query will fetch all data from customer database where particular search query will match any table column of customer table data and finally it will converted that filter data into HTML format and return as response. Now here our controller is ready, So We will move to next step for create a view for search bar. For this we have to go to resources/views/live_search.blade.php. NExt we have add the following code into. Now we have discuss above code. In body tag we have use Bootstrap panel for display customer data in table format with on search textbox. And in below we can see Jquery code in which we have use Ajax script. Lastly we want to set the route for LiveSearch controller two method which we have seen, for this we have to go to routes/web.php and write following code into it. So, here we have discuss how to make live search in Laravel by using Ajax by using simple coding method. in the beginning i want to thank you for this great work, i am following you to learn laravel but i found issue in this part the search does not work with Arabic language if i search by numbers or by english language it is work correctly but with Arabic does not work, can you help me to solve this issue please? How can we append pagination in this case ? new to laravel. can i get the database?